When I am in Zurich, I always go to one of the gourmet restaurants in Niederdorf. Tables spill over on to the cobbled streets. It is best to come early or book a table because the eateries in this street are very popular. My favourite dish is Zurich Geschnetzelte, slithers of chicken or veal in a rich creamy sauce. This is my favourite Zurich Chicken Geschnetzelte recipe. It is very easy to make. You can have veal instead of chicken. 1. Wash and dry the chicken breasts and cut into thin slices. 4. Heat the oil in a large pan and then cook the meat strips on a medium heat. It takes a couple of minutes for them to cook through. 5. Remove the cooked chicken and set aside. Heat the broth and cream in a small pan. Stir in the mushrooms and onion. Add the butter and then season with salt and pepper. Simmer until the sauce for the Zurich Geschnetzelte has the desired consistency. Stir in the chopped parsley and add lemon zest and lemon juice. 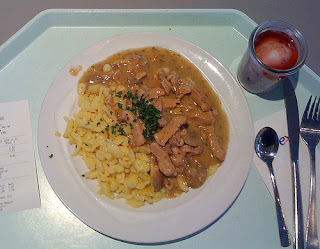 Zurich Geschnetzelte is best eaten with rösti or spaetzli, but rice or noodles are equally good. The Swiss Taste Cookbook has recipes for rösti or spaetzli.